In 1934, the St George's Home For Boys, run by Waifs and Strays Society, moved from Orford, at the north of Warrington, to new premises at the west of the town on Hall Nook Road, Penketh. It was officially opened on December 12th, 1934, by Warrington wire manufacturer Sir Peter Rylands, and dedicated by the Bishop of Warrington. The home could accommodate 30 boys aged from 6 to 14, and six trainees 14 and over. As well as its role as a 'Training Home' (in what is unclear), the home was used as a holiday venue for former residents to return to. The location of the Penketh home is shown on the 1937 map below. St George's Home For Boys site, Penketh, c.1937. At the outbreak of the Second World War in September 1939, the boys and staff were evacuated to Pont-y-Pant in North Wales, where they had previously visited on holiday. They were then distributed to other homes. 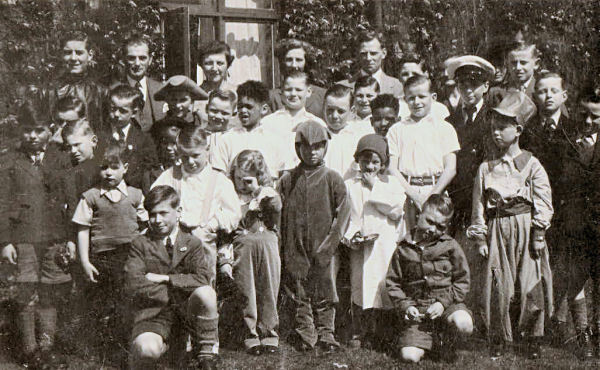 The Penketh premises re-opened in 1946 to receive the residents of the Society's St Andrew's Home for Boys at Matlock, which was being converted for use as a nursery. The photograph below was kindly contributed by former inmate, Graham Thompson. At the back are the house master and his wife a Mr and Mrs Huetson, and the little girl in front scratching her eye is their daughter. Graham is to her left and dressed as a mouse, presumably the occasion was a fête or similar event. St George's Home For Boys site, Penketh, late 1950s. St George's finally closed in 1970 with the Superintendents, Mr and Mrs Huetson, and some of the boys moving to the Ryecroft Home, near Manchester, and the rest being dispersed amongst other homes located nearer to their relatives. The Penketh building no longer survives and the site is now covered by modern housing.